We get a lot of very positive mentions on various blogs and magazines, but for some reason our readers don't tend to leave a lot of reviews on bookselling sites. We'd like to encourage you, if we can, with the Stark House title of your choice. All you have to do is post a review, good, bad or indifferent, the contents entirely up to you and not influenced by us in any way, and send us an e-mail letting us know where we can read it. For every review you post, send an e-mail and we'll put another entry in the drawing. After a few weeks, we'll pull a name at random and you get to pick your book. Once upon a time there was a journalist name Jim Fielder who had written a non-fiction book about some particularly nasty people in New Mexico. Jim also had a novel he was working on, one that Stark House was considering publishing. Before the manuscript was ready, however, a horrible tragedy occurred to Jim himself. Earlier this winter, Jim's house caught fire and burned, killing him. Jim's fiction career may not have taken flight, but I hope everyone reading this can take a moment and give a kind thought to a man who passed away too soon. On a brighter note, Stark House publisher Greg Shepard has been working as the curator for the new Prologue Books, a new e-book publisher looking to serve "as a living record of the crime, science fiction, and fantasy genres," according to Ben LeRoy, publisher of Tyrus Books and Prologue's creator. For all you e-book junkies, check it out. It should be a wonderful source for legitiamately acquired electronic versions of those books that made most of us fans and readers in the first place. No, they don't have the Hardy Boys or the Three Investigators. Go to the library. 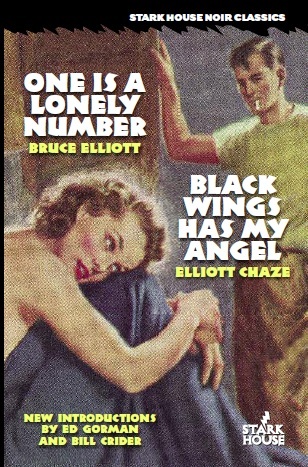 The Whittington book (Rapture Alley/Winter Girl/Strictly for the Boys) is out and shipping, and the Elliotts (Bruce with One is a Lonely Number and Mr. Chaze with Black Wings Has My Angel) is just getting back from the printer. 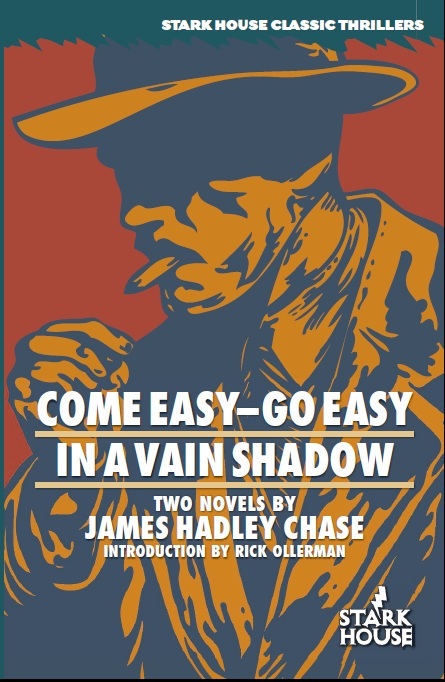 Next will be our first James Hadley Chase volume COME EASY--GO EASY / IN A VAIN SHADOW with two of his best crime thrillers. One of the all time masters, his real name was René Raymond and he was as private and enigmatic as his books were fast-paced and compulsively readable. Raymond/Chase published over 90 books in his lifetime, becoming one of the world's all-time bestselling thriller writers. This was not accomplished without controversy. 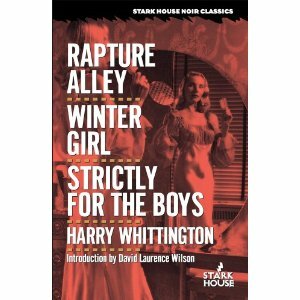 In the book's introduction we talk about the banned books, the accusations, the apologies, the swindles involving the Hollywood Mafia and the effect on his previously unknown friend (and one time publisher), Graham Greene. Raymond/Chase's story is mostly unknown, buried in the recently discovered family papers in an English basement and the memories of the people who actually knew this reclusive author. So while it is difficult to know the man, it is not difficult to know his work. Next month you can read two of his best, even if they make you stay up all night reading. 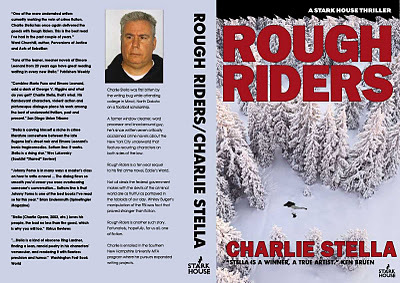 And after that the man who needs no introduction, Charlie Stella, with a follow-up to his first novel, the modern crime classic Eddie's World. And really, he needs no introduction, because he, um, writes his own. Ten years after the events in Eddie's World, things have certainly changed for the characters involved. This time Charlie brings us a look into the world just outside the mob and into the FBI and the witness protection program. It's a crime novel as ruthless and violent the way that only Charlie can write it. You don't need to read Eddie's World first, but you're going to want to. And the rest of Charlie's books as well. And again the standard message: if you're not a member of our Crime Book Club, sign up now to get each book shipped to you automatically and take advantage of the special discount for new members to fill out your collection of back list titles.